Tampa is ranked one of the best cities for investing in real estate, and is one of the most important cities of Tampa Bay. The media recognizes Tampa as one of the ten best cities to buy rental property, and lists Tampa as one of the top 10 markets to invest in rental property. 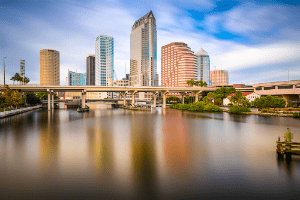 So, here are five reasons Tampa is so highly ranked for real estate investing. According to Mayor Bob Buckhorn, the Tampa building department issued $2.4 billion worth of building permits last year. And, the City Center Master Plan includes a $1 billion, 40-acre project, to drastically improve the waterfront area. Both of these facts are great indicators of construction job growth in the short term, and industry job growth in the longer term. Furthermore, Wallet Hub says that Tampa is the 3rd best city in the United States to find a job. Many large companies such as Home Shopping Network, Amazon, and Microsoft have large offices in the Tampa area. Tampa, St. Petersburg, and Clearwater lead the state of Florida in job growth. These cities added 38,800 new jobs in January 2016, demonstrating Tampa Bay’s rapid expansion in employment, which should continue into the future. Tampa Bay’s population should continue to increase, as people relocate to work on construction projects and fill a variety of job openings. Therefore, housing demand in Tampa Bay will continue to increase for the foreseeable future. In addition to filling employment positions, other factors also affect the number of people living in Tampa. Baby Boomers are retiring, and research shows they are retiring to states with warm weather. As a result, California, Texas, and Florida will have 46% of the total population growth in the U.S. by the year 2030. Florida, unlike California, has no state income tax, which makes it a more appealing state to retire. Lower taxes result in people having more disposable income, in addition to the fact that the cost of living in the Tampa Bay is 3% lower than the national average. Job and population growth, coupled with the affordability of living in Tampa Bay, are three of the many reasons Tampa is one of the best places to invest in real estate. 23% of foreign investors view Florida real estate as a profitable investment, and foreign investors make up 70% of all condominium purchases in Florida. These global investors are another reason Tampa ranks among the top 10 cities in the world for investing in residential real estate. Foreign investors are usually cash buyers who are willing to pay slightly higher prices, which then drives up overall real estate prices. The trend of international investors buying residential real estate in Florida is sure to increase, not decrease, over time. Thus, foreign demand coupled with domestic demand, will keep the supply of properties low, and should help keep property values climbing. Tampa is one of the best cities for buying rental properties and flipping houses. Home ownership is at an all-time low, and population growth is at an all-time high in Tampa Bay, reflecting pent up demand in housing. Demand for housing in Tampa translates into cash flow and profits for real estate investors. Thirteen of the top fifteen counties in the nation for flipping homes based on profits are in Florida. Hernando, Pasco, Sarasota, and Manatee counties in the Tampa Bay area are high performers in gross profit for flipped homes. And, RealtyTrac data shows that the (ROI) for flipped homes in one Tampa zip code is 130%. Tampa is a great place to live, and that is the most important thing when it comes to choosing a city to invest in real estate. The weather is beautiful virtually year round. There are a variety of recreational options, including professional sporting events, cultural events, and nearby beaches. Tampa features world-class hospitals, schools, libraries, police and fire departments, and other services. Tourist attractions include Busch Gardens, The Florida Aquarium, and the Tampa Bay History Center. Downtown Tampa features live entertainment, dining, and shopping. All of this, and more, makes Tampa one of the best places to live, and is why Tampa was included in Money’s Five Best Big Cities to Live list in 2015. Graystone Investment Group is an experienced Investment Group wholesaling properties in the greater Tampa Bay market since 2005. To learn more about the high cash flow investing properties in greater Tampa Bay, please fill out of Investor Profile, or contact us direct.